- Filters are moved back into classes. - Drop of //admin_fix_cache_crest admincommand. - Drop of OLD_PLEDGE related stuff. - BMP filter edited for DDS one, crests are stored under .dds format file. Consider to CONVERT .bmp into .dds ! - Crests are stored on a Map for an easier management. Announcements - Ty Sikken, xblx (&& me ofc). - Renamed Announcements > AnnouncementTable, moved into datatables. Addition of Announcement model. General cleanup and rework. - Addition of critical announcement type. - Addition of scheduled announcement ; you can schedule your announcement to happen X times, every Y times. - Saved under XML format instead of TXT. - Drop of //reload_announcements (handled directly by AdminAdmin //reload generic admincommand), //announce_menu (no use). - Merge of numerous announcements admincommands, now handled by //announce <list|all|add|add_auto|del>. - Addition of //say admincommand (critical counterpart for //ann). - Old //announce renamed for //ann. - Little reorganization on Gameserver.java. - //ann && //say for instant announcements type. - //announce <list|all|add|add_auto|del> for advanced mode. MMOCore - basic update to latest L2J version. - Add a try/catch to avoid core crashing. - Disable Nagle's algorithm (better latency, but bigger bandwitdh usage). It's a real time application, for love of goodness ! - Client is setted on putPacketIntoWriteBuffer method. - Fix an issue regarding Announcement limit. - Add //announce all_auto, allowing to announce auto tasks. Add the appropriate button on Announcements admin panel. - Added project based Java8 compliance on both projects. - Copied project settings from gameserver to datapack. It seems I was using workbench settings on datapack. - Fix few missing stuff on datapack, such as static keywords or nested return. - "Incomplete switch cases on enum option" is now setted to "Ignore". - addition of SecondClassChange script. I can't test all cases and HTMs, so please report any issue on forums. - addition of Q662. Ty RooT. - clean one nested Item Class. - improve readability or performance. - reduce the amount or complexity of variables / parameters when not needed. - HennaInfo is fixed, the class level defines the number of henna slots. Ty RooT. - getItems() from Inventory returns a List, not an array anymore. - Fix possible double attacks issue, ty Hasha. - Decrease timer between multiple pickups. - Added a new multisell bypass, with a newbie check for L2Merchant exchange equipment. Ty ArhsGr. - Fix a NPE regarding CrestCache rework. Ty katara for report. - Simplified FP system (took L2JFree one). Timers are still configurable via config, all others configs are dropped (totally pointless). - A parameter setted to 0 means the action is always possible (you can enable/disable any FP that way). - Added new FPs - GLOBAL_CHAT, TRADE_CHAT, SOCIAL. - GLOBAL_CHAT && TRADE_CHAT FPs are desactivated by default. GLOBAL_CHAT handles "All" and "Shout" chats. - SOCIAL timer has been tweaked to handle animations at the most global running speeds. Edit if you don't like. - addition of Q224, Q228, Q663. Ty to roko91 and RooT. - Fix, anew, the movement stuck issue. - Drop the empty folder in taskmanager. - You can use arrows UP and DOWN to move the character without making your client crashes. No configs. - Chats and RollDice handlers cleanup (nothing fantastic). Roll dice message is sent to anyone. - Complete StopRotation packet. Ty RooT. - Addition of Q220, Q226. Ty roko91. - Drop the unused "block" system on PcInventory. - Drop the "quests slots" system on PcInventory. Easier slots check. - Fix Packet Forge tool. Ty roko91 for the fix. - Fix a NPE on ShortcutInit packet. - Fix a NPE on removeCrest(). - Fix a NPE on calculateRewards(), overhit related. Ty SweeTs for the fix. - RequestDestroyItem got its checks edited, with the addition of CANNOT_DESTROY_NUMBER_INCORRECT message (for both < 1 and > max item number conditions). - Remove GMs priviledges on few packets, leading to a most appropriated casual player experience for : attack stance on restart/logout, slot/weight overbuy, outofcontrol Action. I decide to commit first part of Duels, as there is already a lot of work. All is functional, and far better written than before. Part 2 will get few fixes && little tweaks for Party Duels, probably 10% of what I'm commiting now. - General cleanup : aCis code style, DuelState Enum creation, setIsInDuel > setInDuel rename. Numerous comments && Javadoc as documentation. - Fix a ConcurrentException on DuelManager (couldn't handle simultaneous Duel creations). - Duel id is correctly calculated (it was probably very, very sad before). - Chaotic players (karma > 0) can't start or accept a duel request. - Fix a potential ConcurrentException on buff/debuff storing. - Fix a NPE with _playerConditions. - Fix few custom String for SystemMessage counterparts. - Fix the way duels handle disconnected players. It is considered as a surrender, as L2OFF. Ty sahar for report. - Fix an issue with surrender SystemMessage winner name. - Fix the max range for duel request && check task. - It is fired once the duel is accepted (instead of after countdowns). A duel can now be disturbed during the countdown. - Added missing checks for party duels (zones, interrupted state, distance, pvpflag). - Fix RequestDuelAnswerStart checks, which are now exactly the same than RequestDuelStart packet. - Fix when a party in a command channel requests or accepts a party duel, that party is automatically withdrawn from the command channel. - Fix parties teleport, which are ported back to previous stored location no matter the duel end (in prevision to arena coordinates). - Fix an issue with kneel animation for 'B player/party winner' case. - Add Victory animation for winners. - Animations are sent even if one side is missing. - Revert party duel timer to 120 seconds (retail time). - The 1vs1 countdown is setted to 5sec instead of 3sec + "void" 3sec. Messages for 5, 4, 3, 2, 1 cases. - The party countdown is setted to 30sec instead of 20sec, with messages for 30, 20, 15, 10 cases. It also uses 5, 4, 3, 2, 1 messages from 1vs1. - Drop the 5sec timer at the end of a duel. - The two left tasks, CheckTask && StartTask, use scheduleGeneralAtFixedRate to avoid to generate tasks every seconds. - Rework PartyMatchList, ExListPartyMatchingWaitingRoom serverpackets. L2JFree Commons - part I, Misc. - Holds all String related methods (gathered from misc places). - Addition of 8 static DateFormat to avoid to generate objects. Unify the date writing style over the whole source (few still missing). - Cleanup existing methods, improving performance or readability. - StringUtil.append() allows to append any type of objects, instead of simply strings (which avoid all valueOf / toString). - Util.implodeString() is dropped, use String.join() - Java 8 feature - when possible. - Point3D class is dropped (redundant with Location). - Drop few invalid IDs from RaidbossInfo script. - Format adenas amount on wedding manager, ty oceeman. - L2OlympiadManager, RequestOlympiadMatchList : getOlympiadTasks() creation to handle loop easier. - AdminManor handler : addition of static manor.htm. - FriendsBBSManager, ClanBBSManager, RegionBBSManager, MailBBSManager : replace String concat on loops for StringBuilder. - MailBBSManager : creation of MailType enum. - L2AuctionnerInstance : use a StringBuilder instead of String concat loop. - RaidBossSpawnManager : the long > long > date > format is cleaned up... You can directly use long to format, lol. - SevenSignsFestival : correct use of String.join(). - PetDataTable : fix a strange use of int array > string format. - Drop of GMAudit for bans and buffs action. - All StringBuilder have been reviewed and fixed. The convention name is "sb". - All NpcHtmlMessage have been reviewed. The convention name is "html". - Since JDK 1.5, String concatenation is AUTOMATICALLY replaced by StringBuilder. Don't bother about concatenation, EXCEPT in one case (see below). - FOR loops should always use a StringBuilder, NOT A CONCATENATION. - If numerous types of element must be attached, you definitively should use StringUtil.append() method. - DON'T USE '+' inside StringUtil.append() to seperate parameters, but ',' ! Bian safadinho, ta bem vida loka né hauahua. Obrigado pelo share. Tio Bian fazendo a nossa alegria!! 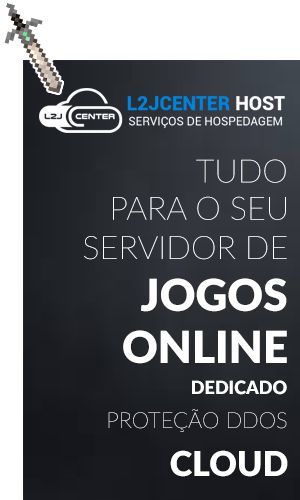 Isto é oficial? Ou você pegou o log dos commits e fez suas próprias modificações? Alguem pode manda o link para download do java 8 ? Pela imagem, o mesmo disse que não se tratam de commits oficiais. Bian, veja o que você mesmo disse no dia 30/03/2015. Agora você tá me dizendo que não é oficial man? Você que esta tentando me contradizer o share é Oficial pode comprar e comparar se for diferente eu pago oque você gastou. Não coloque palavras no que eu escrevi. Ok Bian, obrigado por compartilhar os seus arquivos. Tem algum pré config com a aCis? ela ainda n esta compilada? essa ai e com java 8 ? teria como voce postar uma rev 340 com mods básicos? Creio eu que atualizaram para o 8, e não utilizo acis portando não vou adicionar Mod's na área de tutoriais tem muitos ensinando a adicionar é só perder 1 tempo. Não farei modificações, por isso estou postando o source.